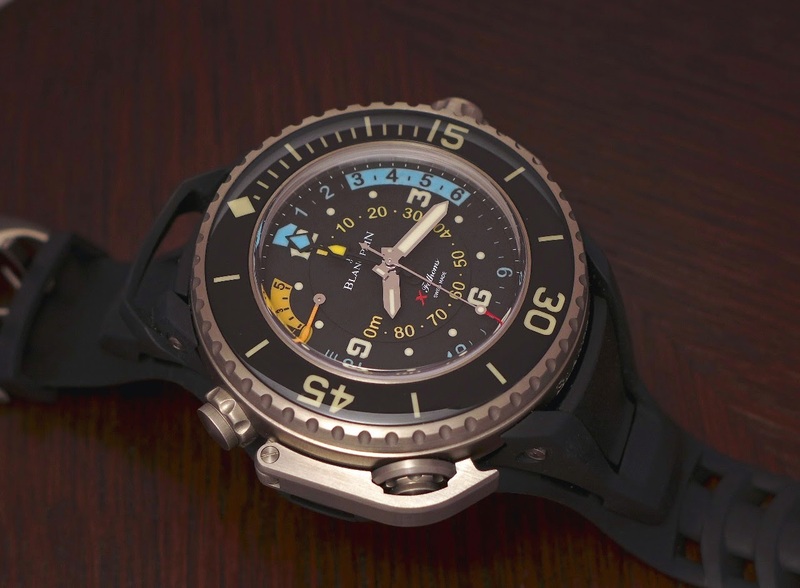 Blancpain - Blancpain X Fathoms. The " Epithoms " of the Fifty Fathoms? Blancpain X Fathoms. The " Epithoms " of the Fifty Fathoms? Invited by some friends from Red Bar ( Yes, Adam Craniotes, you were in the conversations, and in good terms, of course! ) we had a nice moment around the Fifty Fathoms, modern and vintage, at the Blancpain Paris Boutique. 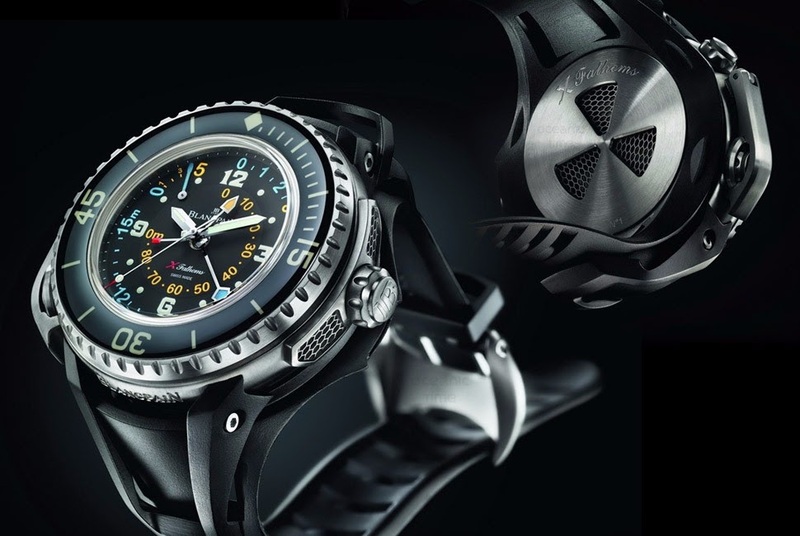 Among the watches I wanted to see and feel, there was one, which always had a special place in my heart and imagination, the X Fathoms. When I saw the first pictures, I immediately thought it was the Epitome ( the spelling on the title was just for fun and provocation ) of the Fifty Fathoms. Blancpain took some distance from the aesthetics, but there is something which reminds you the Fifty Fathoms, and not only the bezel. An " air de famille ". Blancpain overcame the concept, to reach and create A Concept. That's what I love so much in the X Fathoms. 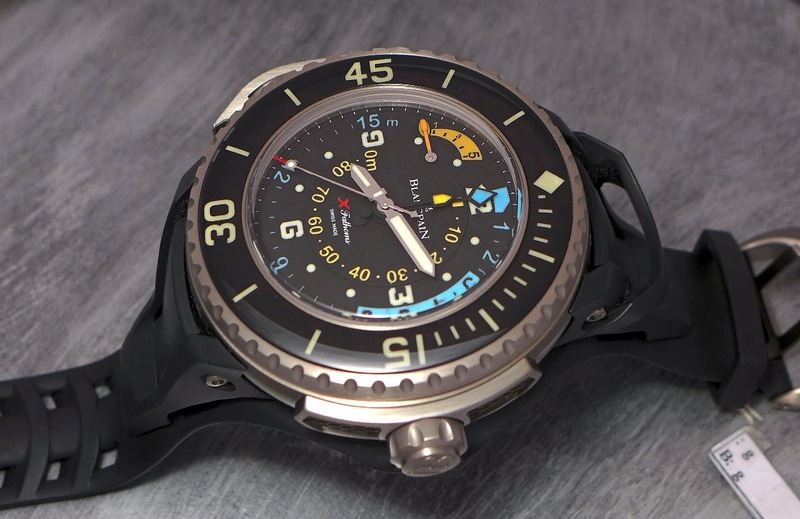 When Blancpain was a pioneer in the creation of the modern diving watch in 1953 ( or was it 1954 by the way, as the birth of the Fifty Fathoms is always announced in 1953, but it seems that is was unveiled to the Public at the 1954 Basel Fair. Same story with the Rolex Submariner, by the way ), the brand is a leader in the field of the technical diving watch, with the X Fathoms. The brochure sums the functions of the X Fathoms very well, so I will quote it: " Mechanical Depth Gauge, Depth indication on two scales, maximum depth memory with secured reset pusher, retrograde 5 minute counter. " 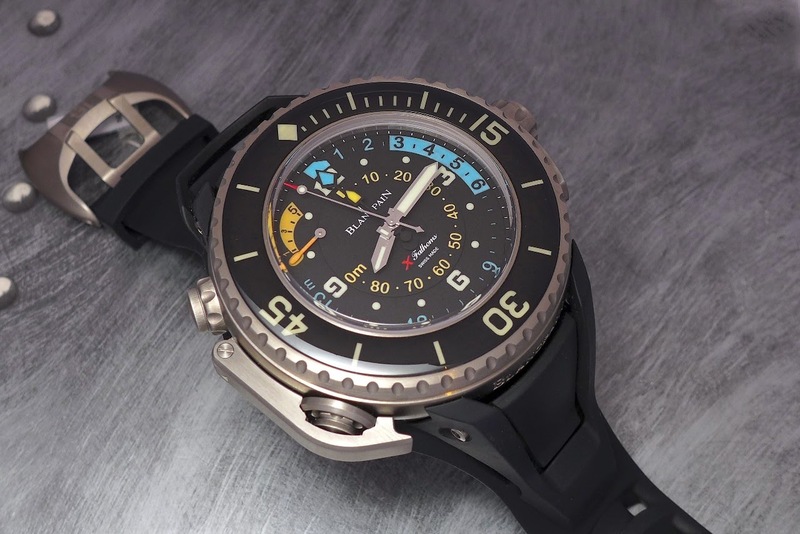 Add the articulated rubber strap, and you have a good idea of what is, in a few words, the X Fathoms. I will have to add an important point, the impressive proportions: the case is 52 mm big, and... 24 mm high! Which is the biggest diving watch I have ever tried, with the even bigger but less thick Panerai Egiziano and its re edition. BUT, at the contrary of the Panerai, I can wear it! Why? Because of the ( very ) curved lugs, which literally hug the wrist. The water resistance is not the most impressive w know, with 300 meters, but it is largely enough for most of us and for professional divers. Here are the pictures I could take during the event. There is one question which has to be answered. The professional or occasional divers will ask if it is really useful... I will just say that of course a diving computer is THE tool to have, but it has the merit to exist, to b-have been created and made, and we can answer the same way than when we are asked if expensive wrist watches are useful, since we have cell phones to give us the time and the date... Yes, it is, because we want it! Best to all, and I would like to thank the Blancpain Boutique team for their welcome. Thank You any wrist pics?